Questions of movie and music stars sexuality and sexual orientations swirl around constantly. Still in this so called diverse, anything goes world, folks get a bit weirded out when their stars aren’t straight, at least in their sexual practices. One area of entertainment that has not been hit with these questions to such an extent is the world of Hip-hop and R+B. Well that is until now. 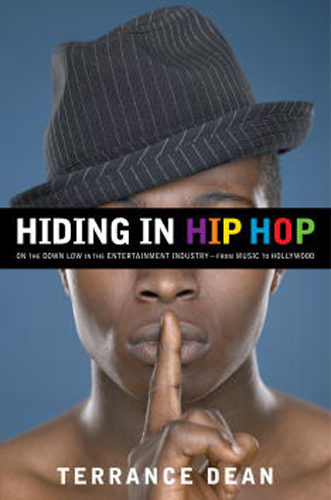 Hiding in Hip-Hop by Terrance Dean( music industry vet and gay man) purports to essentially out all the in the closet, down low brothas and sistas that make the jamz we love, R.Kelly, P.Diddy, Mariah Carey the list goes on + on. The book has just hit news stands to quite a storm of expected blogsphere and real world buzz. At building with bricks our area of focus is not really on whose doing whom or how they do it, but the book got me curious. I mean sure there must be some gay Hip-hop and R+B stars. The law of averages would tell reasonable folks that. But it made me wonder why it had taken this long for a book like this to come out. Is it the thug/hard/homophopic image of “urban music”? The taboo stigma that homosexuality still has especially in the largely church attending black community? Or is that Hip-hop and R+B have really finally done what so many people felt and knew it would? That is take the place of Rock music as the most listened to mainstream marketed soundtrack of youth. Either way, I’m not gonna buy the book, but I’ll most likely do a bit of thumb through at the Barnes+Nobles. With aliases replacing the names of the real stars, but with descriptions any listener of HOT 97 or viewer of music videos will most likely be able to pick up. It should be informing at the very very least…call it a guilty summer read. ~ by MikelJason on June 4, 2008.